Our partner at Children’s Mercy provide medical expertise for Sporting Kansas City and Sporting Academy. The Sports Medicine Center team provides useful health, nutrition and injury prevention tips for all of our soccer athletes in the Sporting Club Network. Injuries and sports participation are a common occurrence and proper nutrition can assist with a speedier return to play. Poor nutrition lengthens recovery time due to impairing the healing process. Start with a baseline of 30 kcal per kilogram. Add 5 to 10 kcal per kilogram a day if the athlete has a soft tissue sprain or strain. Add 10 to 15 kcal per kilogram a day if the athlete has a fracture. Add 25 to 30 kcal per kilogram a day if athlete has had surgery or head trauma. For an individualized calorie recommendation, see a registered dietitian specializing in sports nutrition. one half of the plate: vegetables and fruits. Twenty to 40 grams of protein per meal and snack is optimal based on your needs (every three to four hours). Protein helps athletes heal and repair muscle tissue. Choose protein high in the amino acid leucine during the day (i.e., lean meat, whey protein or part skim cheddar cheese). For the last meal before sleep, choose protein slow to digest such as milk, Greek yogurt or low-fat cottage cheese. After a rehab session, fuel up with a mix of whole grains and lean protein within 30 minutes of the session. Nuts, seeds, avocadoes, oily fish, flaxseed oil, olive oil and omega-3 fish oil help decrease inflammation. Calcium and vitamin D are essential for bone development and repair (think dairy, tofu, leafy greens, sardines, egg yolks and fortified foods). Following these guidelines can help the athlete get back to the sport they love quicker! After recovery, a healthy diet is essential on a daily basis to stay in the game. Source: SCAN/ Sports, Cardiovascular and Wellness Nutrition/ www.scandpg.org. View this article on www.childrensmercy.org. During the heat of summer, it is important to take precautions and protect your student-athletes from heat illness while exercising outdoors. Heat illness is absolutely preventable and knowing the steps for prevention can help keep them safe. Be sure each athlete has a pre-participation physical exam by a physician to identify a history of heat illness or any risk factors. Help athletes adjust to the heat gradually over a period of seven to 14 days by progressively increasing the intensity and duration of exercise. If the athletes wear protective equipment for their sport, phase it into workouts or practices gradually. Avoid exercise if athletes are sick, have a fever, or have a skin rash. Do not allow them to resume exercising until all illnesses and conditions have resolved. When exercising in high heat and humidity, offer frequent rest breaks. Avoid the midday sun by exercising before 10 a.m. or after 6 p.m., if possible. If exercise must be done in the middle of the day, be sure the athletes have access to shade and identify an air-conditioned place inside if they need to cool down. Wear light-weight and breathable clothing. Wear sunscreen. A sunburn can make it harder for the body to cool itself. Make water and sports drinks easily accessible before, during and after physical activity. Before exercise (two to four hours) athletes should drink 16-20 ounces of fluid (approximately one bottle of water or sports drink). Athletes should avoid caffeinated, protein and alcoholic drinks (including soda, coffee and tea). Stop exercising immediately and get them out of the heat. Encourage them to cool their body down by removing extra clothing and equipment. Suggest sitting in a tub of cold water or placing wet towels or ice packs on the neck, forehead and under the arms. Continue to promote drinking fluids. If the condition gets worse or the athlete doesn’t start to feel better, seek medical help. Prevention of heat illness also means these athletes should take care of themselves after physical activity has ended each day. This includes eating a balanced diet and sleeping for a minimum of seven hours each night in a cool environment. Prepare your athletes to exercise in the heat with these recommendations, know the signs and symptoms of heat illness, and allow proper recovery each day to ensure safe participation in physical activity and sports. 1 National Athletic Trainers’ Association Position Statement: Exertional Heat Illness. Casa DJ, DeMartini JK, Bergeron MF, et. al. (2015, September). Journal of Athletic Training, 50(9), 986-1000. Play multiple sports. Participating in multiple sports throughout the year can develop and fine-tune your child’s athletic skills. 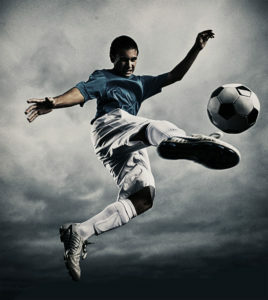 A soccer player, for example, could develop speed and quickness by running track. Or, could improve foot speed and coordination by playing tennis. But if your child specializes in a sport, he or she may overuse their body by repeating the same movement patterns. This could possibly result in injury. Warm-up prior to participation. A proper dynamic warm-up is key to getting the body ready for sports participation. Leg muscles need to be fully activated to reduce injury risk. Adolescent athletes need to gradually begin activity to get the blood flowing to the legs. Some examples include: shuffles for 30 seconds, walking knee hugs (5 x each side), skipping for 30 seconds, lateral lunges (5 x each side), squats (6 to 10 times) and inchworms. Rest! When adolescents are tired, their bodies don’t perform the way they should and movement technique often gets sloppy, resulting in injury risk. Adequate sleep, rest days, and alternating hard workouts with easier workouts are all important strategies to reduce your child’s risk of injury and make them a strong, injury-free athlete. Training must strengthen and stretch key muscle groups. Injury reduction is possible if the adolescent has optimal flexibility through the legs, strength of the hips and core and balance, allowing the child to jump and land safely. The Sports Medicine Center at Children’s Mercy has designed and implemented an ACL Injury Prevention Program. This is the first-of-its-kind in the Kansas City area operated and managed by athletic trainers and sports physical therapists with sports medicine physician oversight. During the 12, one-hour sessions, athletes learn a proper dynamic warm-up, jumping and landing mechanics, and increase core and lower extremity strength. The goal is to improve dynamic control with sports-related movement to reduce injury risk in the adolescent athlete. Everyone talks about “core” as an important building block to injury treatment, prevention and performance enhancement for athletes, but what is the core? smallest back muscles closest to your spine. The core’s main job is to efficiently transfer forces from your extremities in a stable manner. The core is not a “more is better” muscle. This means while doing simple tasks like sitting or walking, contracting your core a lot is not beneficial, and may even be harmful. Core activation should directly relate to the difficulty of the task. Since the core’s role is to appropriately transfer forces, then you should only use a little core for a simple task, like picking up a piece of paper from a table, and should use a lot more while doing a handstand on a balance beam. Training the body to modulate the core, greatly increases the efficiency of the system and enhances athletic performance. What the core does not do is flex the spine (i.e., crunches or sit-ups) nor extend the spine (superman or back lifts). The more superficial trunk system that is important for sport, but is not actually the core, is responsible for these activities. Additionally, there are other muscle groups that are not core, but are complementary and necessary for athletic performance, as well as everyday activities. These include the glutes, hip muscles, neck/shoulder blade musculature and of course leg muscles. One of the most important things you can do as an athlete is work on the whole-body integration so that efficiency of movement is your main goal. This allows for agility, strength, flexibility and speed to appropriately maximize sport performance. Working with a qualified rehabilitative or fitness professional for proper core integration is key! To perform at the top level, elite athletes often work with a dietitian to maximize their performance. Most dietitians recommend some basic guidelines for athletes to follow to be sure they get the correct nutrition to perform well. A good pre-game meal is especially important for morning events. Some examples include pasta, brown rice and bananas. This is not a time to try new foods. It’s also important to drink enough liquids to maintain hydration. Often athletes have a practice or play later in the day and need a snack before the activity. Eating a snack one hour before play can prevent the athlete from feeling hungry. Make sure to drink some water with the snack. For sporting events that last one hour or less, sports drinks can provide fluid and carbohydrates. For longer events, it is even more important to get sufficient carbohydrates. Margaret E. Gibson, MD|Sports Medicine recommends consuming some carbohydrates every 15 to 20 minutes throughout the activity. Five to 10 ounces of a sports drink may be sufficient, however, some athletes prefer a carbohydrate snack or sports gel with water. Once the event is over, it is still important to eat right and refuel the body for future events. A good goal is to eat 50 to 150 grams of carbohydrates within 15 minutes and again two hours after the event. The body recovers faster if you provide it with the right nutrients. For events lasting longer than 1-2 hours and athletes who are participating in competitive, vigorous exercise, a recovery drink may be needed. A good recovery drink that has an excellent ratio of fats and sugars as well as re-hydrates athletes is chocolate milk. Having a glass of chocolate milk within 30 minutes of activity is a good choice for athletes if it’s available. Get more hydration tips here. Whether athletes have a couple of games on the weekend or an all-day tournament, it is important to plan your meals, snacks and hydration to ensure athletes are meeting their nutritional needs to fuel their bodies. Especially if teams are traveling out of town, it is important to stock up on appropriate food choices, sports drinks and chocolate milk to take on the trip. With proper planning, athletes can be prepared to perform well with optimal nutrition and hydration.